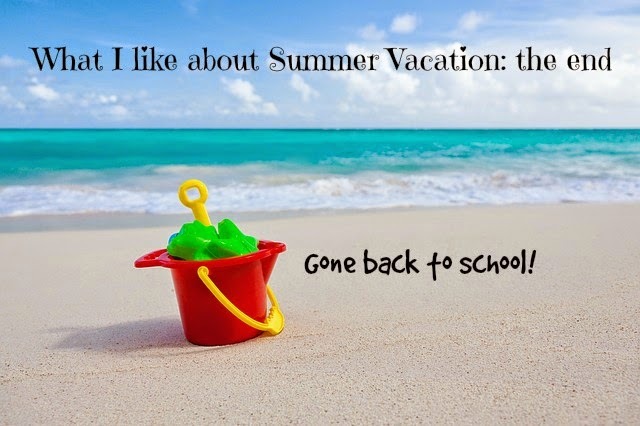 Just one week left of Summer Vacation, and then the kids will be back in school again. Excuse me while I do a little jig. The past weeks have been quite busy, with all 5 kids at home. Which brings me to the first thing that I love about Summer Vacation: there's an end to it. The freedom of Summer Vacation is nice because you know it's not forever. Just ask someone who has lost her job. Freedom is no fun, unless it has limits. The second thing I liked about this Summer Vacation is that I kept my running routine alive. I did not slack off. In fact I added 10 minutes on the elliptical machine to my workouts. On the days I didn't run, I made sure I got another kind of exercise. Yesterday I took all the kids for a bike ride, and we had apple pie and coffee in a nice restaurant. That's going to make a lovely memory. Running has kept me sane during Summer Vacation. It has provided me with some much needed me-time amidst the chaos of seven people in one house. All the time. I love that in a week normal life will resume. I know I've mentioned this in the first point, but somethings can't be said enough! I'm linking up with You Signed Up for What, Oh hey Friday and Fitting it all in. I'm going to miss Summer too! I've really enjoyed this one particularly because we've been at the beach for 2 1/2 months. I'll miss summer. I didn't get to the beach, but always nice to get outside the extra bit. And it's sad, but I love the traffic (or lack there of) on my daily commute in the summer time. Running does keep you sane doesn't it?! I will really miss some of the freedom that summer brings when school starts. I'm so excited for school to start and a routine to kick in for me again - its awesome that you managed to continue your running! I'm certainly not ready for summer to be over although I do look forward to cooler running weather ( not too cool though)! I love your first point. Vacation offers time to do things differently, have another routine, but it is nice when it comes to an end to get back to a more typical routine. And we get to look forward to the next vacation. My kids are so ready to go back to school ! Five kids and you manage to run? Oh my lord, now I feel super lazy!!! In all seriousness, congrats and well done! They're the réason I run! I love this! The first point is especially true. My daughter's nursery has been closed for 2 weeks and much as I love having her around, I think we're both a bit fed up with each other now! She wants to go back to nursery and have fun with her friends! I'm so looking forward to summer! Springs really happening here and I'm totally loving it! You are right to have kept your exercise schedule with all things going on, sounds like it has been good for you. I dont know how you maintained sanity with 7 at home. Wonder what you will do when everyone is off to the first day of school? Thanks for linking up this week, I appreciate it!! I'll definitely do a little jig!